When I saw so many dark ruby red cherries at the market and in the supermarket, I was tempted to bake a black forest cake. Basically a Black Forest cake, is layers of chocolate cake, kirsch soaked cherries, grated chocolate and whipped cream. Kirsch(kirsch wasser) is a spirit made from tart cherries. I would have loved to bake this cake or gateau as its called. However, my family would have probably thrown me out with all the dessert I’m making for the past few days. Remember I mentioned in the last dessert post that I was looking for brownies. Well, its for this dessert. Since I couldn’t bake the cake(who will eat it??) 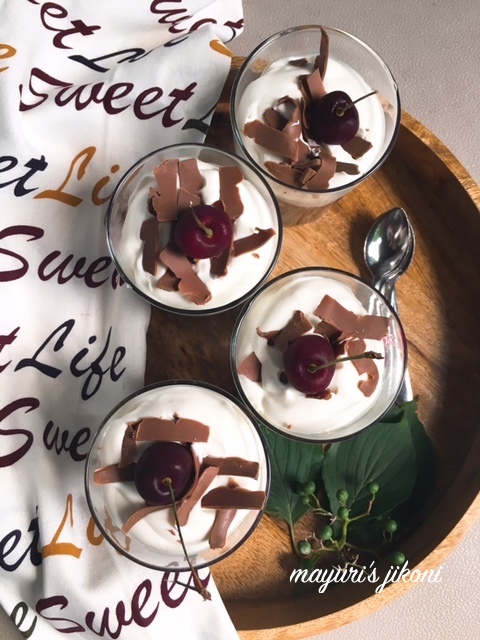 and as the Blogging Marathon theme suggested No Baked Desserts, I decided to make the next best thing to Black Forest Cake and that is a Black Forest Trifle. Usually trifles are set in a big bowl and then served by scooping out a portion. I decided to go the mini way and made them in individual portions.I used up some chocolate muffins that I had baked sometime back and since no one wanted to eat the last 3 muffins, I put them in the freezer for future use. This trifle is so delicious and easy to make. Since I wanted an alcohol free dessert (Shravan month no alcohol), I made some cherry compote or sauce. Though Father and Son were complaining that I’m the reason they are putting on weight, they relished the dessert thoroughly. Just can’t win men…can you? To prepare the cherry sauce, put the pitted cherries, sugar and juice or kirsch in a pan. Put the pan over medium heat and cook the cherries till they become soft but not mushy. You’ll have a syrupy liquid but don’t discard that or cook it further as the syrup will help to moisten the cake. Let the cherry sauce cool down completely. Take 4 clear glasses or bowls. Break up the muffin or brownies into pieces. Divide the cake between 4 glasses or bowls. Spoon the cherry sauce over it. Top it with fresh whipped cream. Leave the prepared trifle in the fridge to cool for an hour or so before serving if you want to. If the syrup is not enough to moisten the cake sprinkle some orange juice or kirsch over the pieces. Used canned cherries if you don’t get fresh ones. This trifle look awesome, with my favourite cherries in it, I want to taste now. these look beautiful, and loved the juicy cherries imparting its lovely color to the whipped cream.. Such an awesome combination you have here..will surely make it sometime.. I am yet to try black forest trifle. They looks so tempting. Thanks Rafeeda… I too loved this trifle. Thanks Padmajha, the fresh cherries in the dessert taste so good. Try it Sapana, it tastes really good. looks sooo delicious! fresh cherries gives great flavor to the sauce, and i love that sweet life napkin by the side, so white and bright!